After being on the market a year, the iPhone X has no shortage of cases available. There is, however, only one with a built-in battery and boasting Apple's coveted MFi certification and the "Made for iPhone' logo on the back of the packaging. Moment is known primarily as a photography company, with all their products designed first and foremost with photographers in mind. That doesn't mean if you aren't a photographer you should leave now, though. Moment's offering is so well designed that almost anyone could find something to appreciate. Primarily, this is an iPhone case. It needs to protect your phone. Crafted largely from a soft-rubberized material, it does a good job at this. There is a slight lip on the front which helps the screen not make contact with a table or other surface. Inserting the phone is simple, and similar to Apple's own iPhone 8 battery case. Just bend the top of the case back, and slip the phone in. It slides down until the Lightning connector plugs in and the top of the case is able to fold back into place. Be advised that there's a high chance of screenshots and Siri being triggered in the process. Along the bottom, you find two anchors for attaching a strap, a female Lightning port, and two grills angled forward. Both the microphone and speaker ports are angled forward which actually helps the speaker sound louder when playing back video. The buttons can be a bit stiff to press but aren't bad. They work well enough to do their job while continuing to protect the phone. A nice texture also surrounds the case, providing a bit of extra tactile grip. Moment says this case should double the battery life of your iPhone X. When out and about for a long weekend or shooting endless photos/videos, that added battery life and can quite useful. 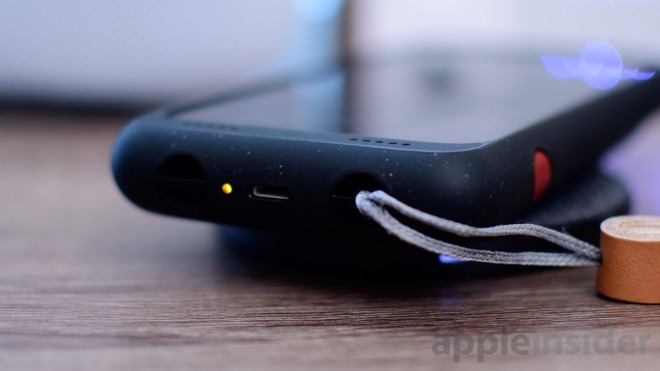 To charge the case —and your phone —you can plug in a Lightning cable to the bottom. Same as you would without a case. That means you don't need a micro USB or USB-C cable lying around. 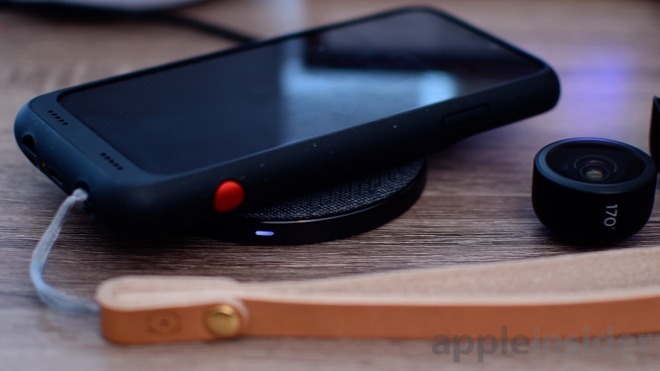 Even better, the iPhone X or iPhone XS case is able to charge wirelessly using any Qi charger. Just set the phone down and power both the case and your phone together. As a lens manufacturer, it goes without saying that this case supports their full lineup of lenses. That includes the new anamorphic lens, as well as the existing wide angle, tele, superfish, and macro lenses. 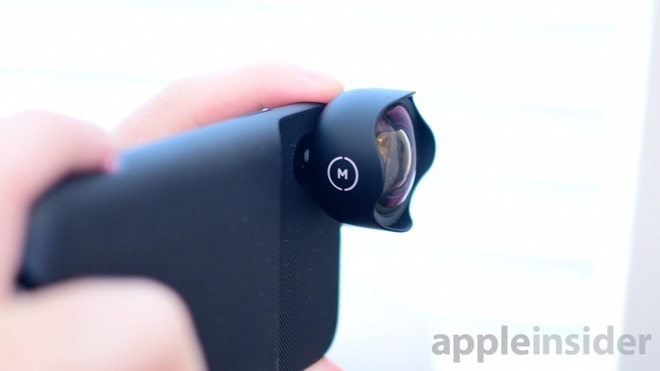 These excellent pieces of glass can attach to either the wide or tele lens of the iPhone. That means you can achieve stuff like extremely wide shots, or even 4X optical zoom. The shutter button resides on the lower right side, slightly recessed so it isn't accidentally triggered. It is a vivid red piece of anodized aluminum but has a tendency to move around a bit in its slot. A half press of this button will focus the shot, and a full press will snap the picture, just like on a DSLR. The bottom of the phone has a pair of anchor points to attach a strap. Since there are two, you can put something like a neck strap, or you can connect a single one for your wrist. If you've ever shot photos in a precarious location such as on a boat, leaning over a bridge, or on a cliffside, this adds some much-needed sense of security. All of this comes together in the Moment app. It is the best place to shoot photos with all the necessary manual controls. If you are shooting with any of Moment's lenses, it can even adjust the EXIF data in the photo to include the lens used —those this does need to be manually set. The app is also where the case settings can be viewed and the software can be updated. 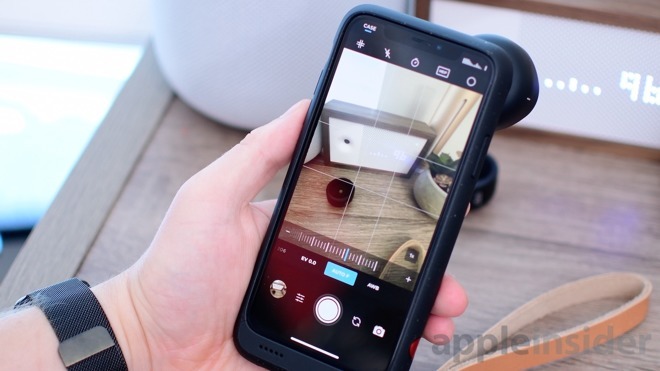 There are many DSLR-like manual photo apps on the App Store, but Moment's happens to be free to download and works seamlessly with all of Moment's accessories. 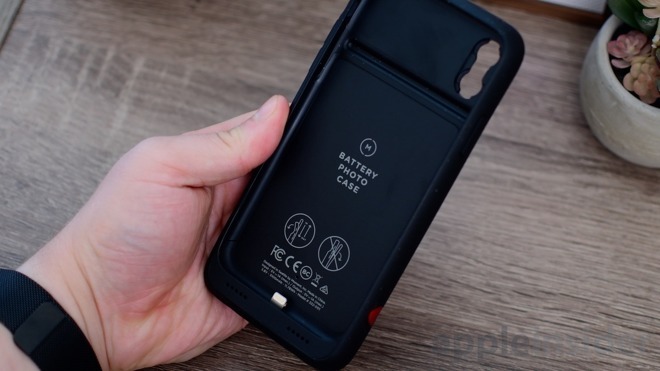 We love Moment's battery case. It does add quite a bit of heft to the phone, but it has a ton of functionality. Just having it on your phone extends the battery life without any extra cables or work. The only downside is it doesn't work with external audio accessories through the Lightning port because of a restriction by Apple —and this includes CarPlay. Basically, Apple only allows charging and syncing, but audio cannot pass through the connector. This limitation is seen on all third-party battery cases. You can pick up the Moment Pro Photo battery case directly from Moment for $99 —well worth it for the additional features not seen on other announced battery cases we've seen. Note: we tested out the iPhone X model of the case, though it is also available for the iPhone 7/8 and 7/8 Plus. 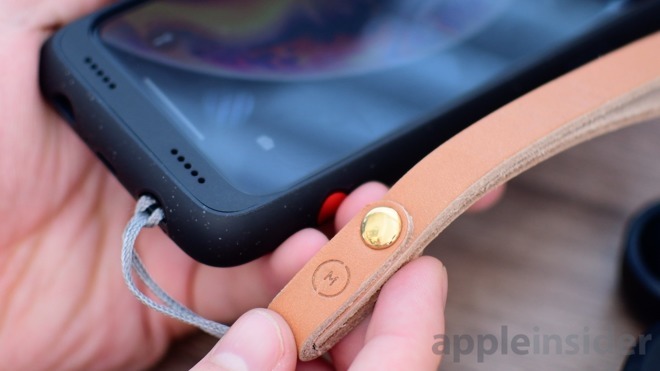 Moment says that the case does support the iPhone XS, but they must complete the MFi program again for the new device before they can advertise it as such.